This Fall saw the long-awaited release of Matȟó Waúŋšila Thiwáhe, the Lakota Berenstain Bears project – at last! 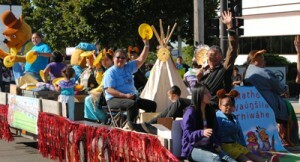 Launch point was the United Tribes International Powwow in Bismarck, ND on September 8-10. The voice cast and costumed Mother and Father Bear rode a float in the annual Parade of Champions through Bismarck, sparking cheers and photographs from all residents. 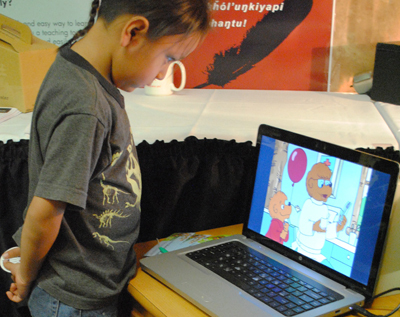 Select episodes of the series played on a loop at the LLC booth on the powwow grounds, drawing children, parents and grandparents, who were absorbed in the sound of the language being spoken by a caring family. 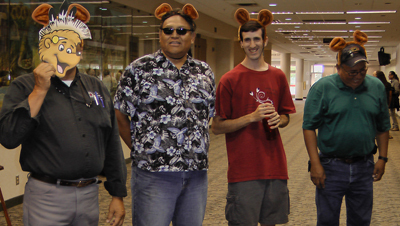 Mother and Father Bear met scores of fans – check out our picture albums on Facebook. An honoring ceremony during the powwow’s Grand Entry recognized the work of the voice cast, the co-producers from Standing Rock and LLC, and the generosity of Berenstain Enterprises, our legal advisor and other businesses that waived fees and made gifts to make the series happen. LLC has been keeping followers updated on the project via Facebook and a dedicated website, LakotaBears.com. For those of you just tuning in, Matȟó Waúŋšila Thiwáhe is Lakota for “The Compassionate Bear Family.” It is 20 episodes of the beloved Berenstain Bears cartoon series made popular on PBS, completely translated and performed in Lakota. Twelve voice actors were recruited from the different Lakota communities to include distinct regional dialects in the Bear Country population – making the series valuable for deeper linguistic study of the language. Each half-hour broadcast contained two episodes, making a ten-week broadcast schedule, which ran on Sunday mornings from September 11, to November 13th on South Dakota Public Broadcasting and Prairie Public TV. Both stations ran the series on their digital cable subchannels. Beginning this week it will be broadcast on KOLC and CRST’s IPTV. The response to this project has exceeded all expectations. Between the promotional efforts of the two TV networks, LLC’s own publicity campaign, and an Associated Press wire story, hundreds of thousands of people worldwide have been introduced to the Lakota language as spoken by the Berenstain Bears. Stories have appeared in 160 newspapers internationally. Blogs, web sites and radio shows have also featured the Bears. Some of the most prominent coverage has come from Bloomberg Business Week, the Washington Post, Time Magazine, the San Francisco Chronicle, the Huffington Post, and Rachel Maddow’s blog. At this writing, Matȟó Waúŋšila Thiwáhe episodes posted at www.lakotabears.com have been viewed more than 20,000 times. Now the DVD is published and shipping and you can invite the Bears into your home. LLC launched the DVDs at Prairie Edge Bookstore in Rapid City, SD on November 19 with a DVD-signing event. Voice actors Manny Iron Hawk, Ken and Bernadine Little Thunder, Naomi Last Horse, Dainna Red Owl, Peter Hill, and Ben and Sandra Black Bear were on hand to meet fans and autograph the DVD set. We are very proud of our actors, and seeing them so honored by fans of all ages is a huge pleasure. The launch event also got a preview of the Matȟó Waúŋšila Thiwáhe Teachers’ & Caregivers’ Guide, a 230-page volume that is now available for digital download and will be ready for hard-copy purchase on Dec. 12th. The DVD comes with a 12-page booklet that gets viewers started discussing the episodes and the Lakota language. The Teachers’ & Caregivers’ Guide is a more comprehensive study tool, with transcriptions of each episode, a vocabulary list, and discussion questions in Lakota. Just imagine reading through the scripts at home, acting out the Bears’ adventures in Lakota! The Guide was produced with a grant from the First Nations’ Native Youth and Culture Fund, and was written by Peter Hill (who played “Skuzz” in Matȟó Waúŋšila Thiwáhe ) with help from Ben Black Bear and LLC Linguistic Director Jan Ullrich. Both the Matȟó Waúŋšila Thiwáhe DVD and Teachers’ and Caregivers’ Guide can be ordered at the LLC bookstore. They make great Christmas gifts! They are also available from select retailers such as Prairie Edge Bookstore in Rapid City, SD. Standing Rock Sioux Tribe, as co-producers of the entire project, will also distribute DVDs. Moving forward, Matȟó Waúŋšila Thiwáhe will be broadcast next on local cable providers in South Dakota, including KOLC in Pine Ridge (Golden West Telecommunications Company), and the Cheyenne River tribe’s network, CRST Telecom in Eagle Butte. Also look for the Bears at the Lakota National Invitational in Rapid City, December 17-19. There will be screenings, visits with the cast and a merchandise table where you can pick up DVDs as holiday gifts. 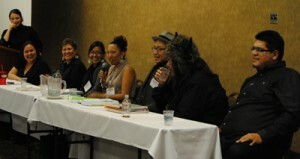 The 2011 Lakota-Dakota Language Summit was a great sensation and the LLC stand was again the nexus of activity. Thanks again to all the visitors that stopped by. Our friend, Timoti Karetu made the trip from New Zealand to talk to the crowd about the journey of the Maori people, which has created the world’s greatest success so far at indigenous language revitalization. LLC Linguistic director Jan Ullrich gave a presentation on “How to become fluent in Lakota.” Another well-attended session was the presentation by theLLEAP students from Sitting Bull College. Videos of both of these sessions are available for online viewing at the KOLC website. During the summit, LLC also honored schools that had shown marked improvement in language learning test scores, which are measured by LLC’s pre- and post-testing system. In 2010-2011, these schools saw achievement in mastering the language. Highest Achieving High School – Red Cloud High School (Pine Ridge). Congratulations to all of these students and teachers! The Matȟó Waúŋšila Thiwáhe cast, crew and sponsors were also honored at the Summit to be recognized and thanked again for their work on this project. Find LLC and the Bears at Lakota National Invitational! If you are attending the Lakota Nation Invitational Tournament in Rapid City, SD, December 16-18, look for the LLC table promoting Matȟó Waúŋšila Thiwáhe. Voice actors Peter Hill (“Skuzz”) and Manny Iron Hawk (various characters) will be on hand to talk with the show’s fans and discuss speaking and learning the language. 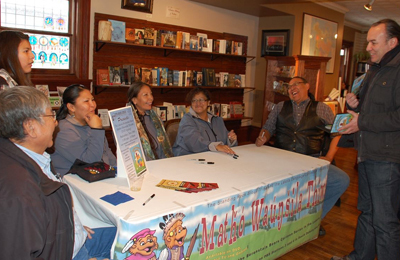 The Matȟó Waúŋšila Thiwáhe DVD will be available for purchase at Prairie Edge Bookstore table in Rapid City. Peter Hill and Philomine Lakota have also coordinated the LNI Language Bowl that takes place on Wednesday Dec. 14th 9am in LaCroix Hall C in the Rapid City Civic Center. They have created new questions for the students using the standardized orthography used in the New Lakota Dictionary. Peter Hill is the former Lakota language teacher at Red Cloud School, and Philomine Lakota is Red Cloud’s Director of Lakota Studies. A heartfelt wóphila to both of these hardworking teachers. The documentary film project Rising Voices/ Hótȟaŋiŋpi, being produced by the LLC sister organization, The Language Conservancy , has been awarded a grant from the Native American Public Telecommunications Inc. (NAPT)). The grant is for the film’s research and development phase, and allows us to bringFlorentine Films/Hott Productionss out to Lakota Country this spring. 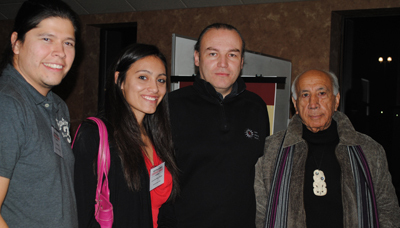 The Film project has also been supported by theDakota Indian Foundation. NAPT is a non-profit professional organization for Native Americans in all areas of media production and distribution: radio, television, film, and online. Native American subjects popped up on television all through November, which was Native American Heritage Month. One PBS program we had to catch was We Still Live Here, a documentary about the efforts of the Wampanoag tribes of Cape Cod, Massachusetts, to revive their language even though no one has spoken it in more than a century. Assistant Producer on that project is Jen Weston, a Hunkpapa Lakota who has attended Brown University, worked for the Standing Rock Sioux Tribe, and now is a Program Officer for Endangered Languages at Cultural Survival, Inc , Inc. Jen is also Associate Producer for Rising Voices/Hótȟaŋiŋpi. The Mother Tongues website Jen helped create is a must visit! 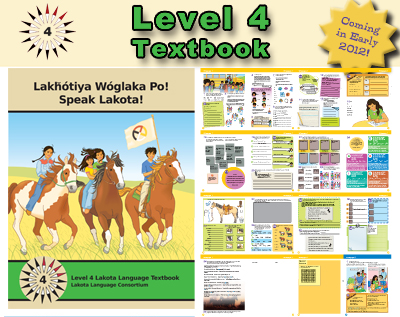 The Level 4 textbook is now in its final review stage, building on the hard work and input of our Consultants during the year and our Teachers and Test-Class Students during the 2011 Lakota Summer Institute. Our hoped-for availability date is January 2012 and pre-orders will be taken soon at the LLC Bookstore. The Level 4 project has received generous support from international donors as well as the Federal government. Our deep thanks and appreciation go out to Tatanka Oyate (Germany), the Onaway Trust (Scotland), Lakota Herb Company (Canada), the Moore Foundation (USA), and especially to an anonymous donor from SIoux Falls, SD with a gift late in the year. The Compassionate Bear Family is coming to your house! They make a grand entry through South Dakota Public Broadcasting and Prairie Public television on Sunday, September 11 at 9 am. 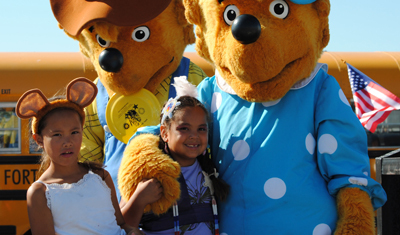 Matȟó Waúŋšila Thiwáhe, or “The Compassionate Bear Family,” is the Lakota language name for the Berenstain Bears, whom you have seen on PBS and in storybooks for the past four decades. You may have also followed them on their Facebook page for the past year, as recording progressed in Bismarck, ND. Finally at the 42nd Annual United Tribes Powwow in Bismarck, ND you can participate in events launching this historic television show on the weekend of the premiere. The Tribal Leaders’ Summit Banquet on the evening of September 7 will enjoy a special preview screening. Dancers costumed as the Bears family will participate in the Powwow’s September 8 Grand Entry, and an honoring ceremony will take place to recognize the project’s developers and supporters. More preview screenings will be played at the Powwow’s Children’s Day activities on September 9. Get the latest updates on the premiere and broadcast schedule from the new Maȟtó Waúŋšila Thiwáhe website. Bookmark it now! A more extensive launch is a series of events for parents and teachers with Lakota language students around showings of the episodes in Standing Rock schools, throughout September. Beginning September 11, two episodes per week of the Maȟtó Waúŋšila Thiwáhe will broadcast on SDPB’s Digital 3 channel and Prairie Public’s Digital 4 channel every Sunday morning at 9 am through November. Local access stations KOLC and REZ IPTV in Eagle Butte will then broadcast the series to viewers on Pine Ridge and Cheyenne River Reservations, respectively. Other showings will be presented at two Rapid City, South Dakota events this fall: the Lakota-Dakota Language Summit, November 17-18, and the Lakota Nation Invitational in December. A DVD of the Matȟó Waúŋšila Thiwáhe series will be released in November. The User’s Guide booklet is being created with support from the First Nations Development Institute/Native Youth and Culture Fund, based in Longmont, CO. The User’s Guide will have a more in-depth online supplement, for classroom use and advanced individual Lakota language study. 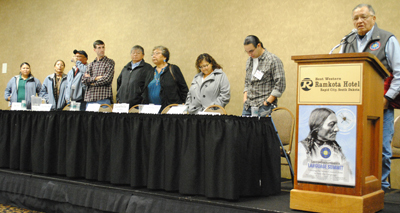 Other support for the project has come from the North Dakota Indian Affairs Commission. If you can’t get SDPB, Prairie Public, KOLC or IPTV on your TV, lakotabears.com will stream episodes and have the User’s Guide online supplement available for download. Subscribe to the LLC YouTube Channell page, too– a second newly updated Matȟó Waúŋšila Thiwáhe trailer should be posted soon. The fifth Lakota Summer Institute was completed June 6th-24th having seen 74 participants and 21 classes in three weeks. Sunshine Carlow, Education Manager for the Standing Rock Sioux Tribe Sioux Tribe, said that she noticed a “more relaxed attitude” in general as learners and speakers found it easier to communicate with each other in Lakota. Students arrived from New Mexico, Oklahoma, Minnesota and Illinois, as well as from all across the Dakotas. Carlow also said that budget cuts at tribal schools meant that many teachers had to attend at their own expense, and many came for just one week instead of the full three-week schedule. The lower daytime attendance numbers were more than made up for by high enrollment in the new intensive Lakota courses in the evenings, led by LLC Linguistic Director Jan Ullrich. This immersive class was considered very successful, and contributed to a different atmosphere of learning that got students energetically engaged with speaking and listening. Classes to prepare teachers for immersion teaching were also well-received. This new course of study was led by Mr. Francois Fouquerel, an instructor with the Concordia Language Villages. Concordia is a language-immersion summer camp in Minnesota, which gathers youngsters in “villages” for extended immersion in a foreign language. The undergraduate degree programs in teaching Lakota language are moving ahead with the first cohorts gathering at two universities. Classes in the Lakota Language Education Action Program (LLEAP) begin at Sitting Bull College and the University of South Dakota - Native American Studies Department in late August. One instructor at LLEAP/USD will be a young man who knows something about leaping between cultures and languages. 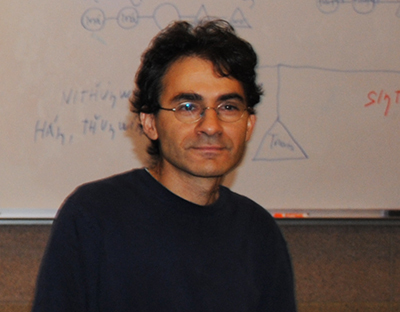 Dr. Armik Mirzayan is originally from Armenia. His first languages were Armenian and Farsi, and he was immersed in both English and Spanish after his family relocated to Los Angeles as refugees from the Iranian Revolution in 1979. Learning and speaking multiple languages was already a necessity in his world, so this interest in languages continued through his university study in physics at UCLA. After earning a Masters in Physics at the University of Colorado-Boulder, Armik switched his graduate work to Linguistics. He learned Cochabamba Quechua, one of the Southern Quechua dialects spoken in Bolivia Quechuan. Even so, Armik received his PhD in Linguistics with a focus on phonology/phonetics in Lakota which he also learned. Armik’s involvement in Native American language was seeded by a high school math teacher who encouraged him to discover American history for himself, learning about how it was lived, rather than relying solely on information from textbooks. His deep interest in Lakota began when he met David Rood at the University of Colorado and took Rood’s course on endangered languages. Armik went on to become a research assistant in Rood’s fieldwork documenting the Wichita and Lakota languages. He began to learn Lakota from the extensive resources at the University of Colorado, and from meeting with a small group of Native speakers once a week. Armik says his background in physics came into play when considering the importance of sound and pronunciation in communication, but that psychology became crucial as well. In Lakota, Armik says, “in Lakota there are distinctions between unaspirated and aspirated sounds (k, kh, and kȟ). Meaning, aspiration - several other sound distinctions - is crucial for making meaning distinctions in the language. The sounds make completely different words and meanings, so you can’t afford to mispronounce. Habitual English use influences sound, like in intonation. In Lakota, questions do not have a rising intonation. Plus, ‘English thinking’ affects how a new language is learned and spoken, and it is natural for adult learners to carry ‘English thinking’ over into Lakota pronunciations.” Armik hopes that more field recordings of informal Lakota conversations can clearly establish the “Lakota thinking” at the heart of fluency. Armik thinks that the orthography of Lakota that is used in the LLC book will help LLEAP students get a handle on reading and pronunciation. When he was learning English, word spellings were so different from word pronunciations that he had difficulty catching on. With Lakota, however, the spellings match pronunciations so exactly that he was able to learn quickly. Armik is impressed by the excitement at USD about LLEAP, and the new focus on language at the Native American Studies Department. “I really am extremely grateful that the LLC has provided this opportunity for revitalizing the Lakota language,” he says. “After being at the LSI and seeing the impact it is making on the younger generation ... it is truly amazing!” The best way to stay updated on LLEAP is to join the LLEAP Facebook site. NLC 2nd edition is Here! 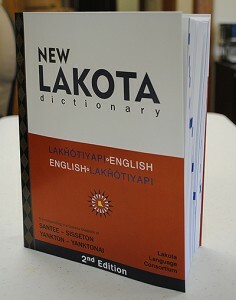 The 2nd edition of the New Lakota Dictionary has finally arrived! We know it’s been a long wait –but this 2nd Edition is a larger book, with over 100 additional pages and 3,160 additional Lakota words. Thousands of corrections were made to the text, based on feedback from dictionary users, speakers, and teachers. The grammar sections have been updated, and user-friendly features such as maps and search helps have been retained. Thanks to the Lakota language community, we have built a better NLD. On the outside, the NLD Second Edition has a sturdier cover, embossed and laminated to resist damage. This greater page count and stronger cover means the price is slightly higher ($49.95) than the First Edition. LLC will only sell at this affordable price! We strongly recommend that Lakota language students get a copy of this 2nd Edition NLD if at all possible – the improvements are so substantial that it is a better tool for learning. Also remember that the NLD-Online is available to assist you and it's a great way to interact with the forum. Order at the LLC Bookstore . Planning and preparation continues for the LLEAP initiative, which coordinates two new Lakota language teaching degrees at Sitting Bull College in North Dakota, and the University of South Dakota. Applications will soon be available at the LLEAP website. Lead administrators have now been hired: Kimberlee Campbell, PhD, will be Coordinator and Instructor at USD, while Sacheen Whitetail-Cross will be the Project Director at Sitting Bull College. Campbell has spent decades as a teacher and coordinator of second-language teacher training programs, most notably at Harvard and Brandeis Universities. She brought her working knowledge of Lakota to the 2009-10 Lakota Summer Institute to help introduce teachers to the Level 3 textbook. Whitetail-Cross comes to LLEAP from Bismarck State College. Planning is still underway for Lakota Language Teaching and Learning degree plans, and preparation for majors who will begin classes at their respective schools in September 2011. (So if you are interested, please register at the the facebook site and website.) LLEAP students will be on the leading edge of a new wave of dedicated professionals establishing Lakota as a linguistic heritage that can be learned and lived. The best way to stay updated on LLEAP is to join the LLEAP Facebook site. The bulk of recording for the landmark Lakota Berenstain Bears animated cartoon project wrapped up in December, at Makoche Studios in Bismarck, ND. The project now moves into post-production with the team at Makoche mixing audio tracks and joining them to the video masters of the cartoons. The Lakota title for the series is Matȟó Waúŋšila Thiwáhe, “The Compassionate (Generous, Kind) Bear Family.” The Matȟó Waúŋšila Thiwáhe emphasizes qualities central to traditional Lakota culture: compassion, patience, generosity, hospitality, and respect.